NAIROBI, Kenya, January 22, 2014 (ENS) – The Kenyan government has sent Kenya Forest Service guards, with police support, to Embobut Forest in the Cherangany Hills to forcibly and illegally evict thousands of Sengwer indigenous people from their ancestral forest lands and burn their homes and belongings. Cherangany Hills, rolling slopes in Kenya’s western highlands, are one of the country’s five main forests. 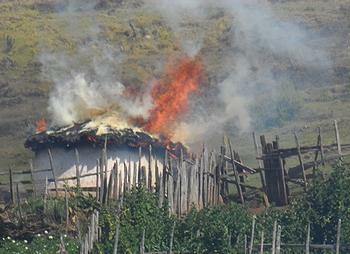 In their forest glades high in the Cherangany Hills, Sengwer homes have been being torched for the last 10 days. Today the Administrative Police have moved in to forcibly evict those who remain. These are the same police who have been issued a specific court order requiring that they arrest anyone carrying out Sengwer evictions. 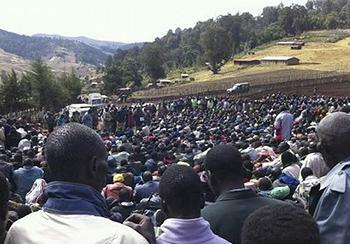 The Sengwer and their defenders say that by carrying out these evictions and burnings, the Kenyan government is ignoring the orders of its own courts, its Constitution, and its international legal commitments. Article 63 (d) of the Kenyan Constitution recognizes the rights of communities to own ancestral lands traditionally occupied by hunter-gatherers. These evictions also violate international law on human rights, biodiversity conservation and sustainable use and threaten the survival of their way of life. In March 2013 Eldoret High Court issued an interim injunction which forbids the Kenya Forest Service forest guards and the police from carrying out evictions and burnings of Sengwer homes. This injunction was renewed in November 2013. On January 18, the Judge at Eldoret High Court issued further orders requiring that the police arrest anyone breaching the injunction. However, say the victims, as the police are providing support to the Kenya Forest Service guards carrying out the evictions, they themselves are breaching the injunction. Despite the illegality of these evictions, the Kenya Forest Service, with police support, are continuing to burn Sengwer homes and evict Sengwer communities in the Embobut area, and they are now planning to extend evictions to all other areas in the Cherangany Hills forest complex to include Kapolet and Lelan/Kamolokon. This means the removal of the entire population of Sengwer indigenous people living in the Cherangany Hills from their ancestral lands, affecting tens of thousands of people. In December 2013, the UK nonprofit group Forest Peoples Programme and over 60 other international conservation and human rights organizations launched an appeal to the Government and Parliament of Kenya to stop the forced and illegal evictions of the Sengwer indigenous people. They renewed this appeal to President Uhuru Muigai Kenyatta on January 14. This logic is amplified by the prospect of securing funding through the UN-backed program known as REDD, Reducing Emissions from Deforestation and Forest Degradation. REDD funding for KFS-controlled projects may result in first devastating indigenous forests and then promising to reforest these areas using fast growing plantation species. In 2007 the Kenya Forest Service began receiving funding from the World Bank for a Natural Resource Management Project, and every year since then, except 2012, Sengwer homes have been burned by KFS guards in a process of harassment and intimidation that Sengwer defenders say completely disregards the Bank’s safeguard policies, as well as disregarding the Bank’s own Indigenous Peoples Plan that was drawn up prior to the project. Over this period the Sengwer were offered land elsewhere but each time they refused to move from their ancestral lands. In a change of tactic, President Kenyatta, elected last April, came to Embobut in November and offered 400,000 Kenyan shillings to a list of 2,784 “beneficiaries,” whose names have not been made public. These included some of the indigenous Sengwer, as well as internally displaced people who are mostly landslide victims, and those who have land elsewhere but have seen Sengwer land as available to cultivate. For the Sengwer, who have no land elsewhere, eviction means being torn from their ancestral lands and the end of their community, so 400,000 shillings is nothing and will soon disappear, says Forest Peoples Programme.